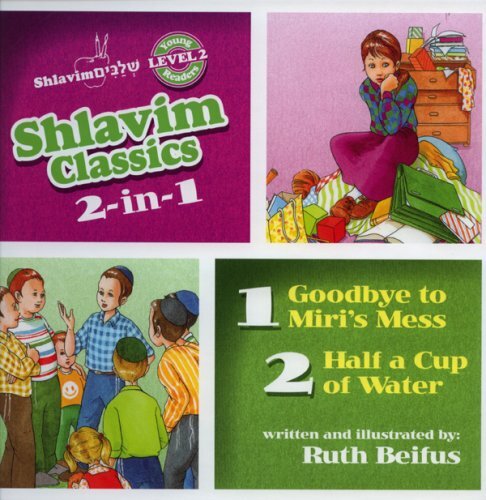 Expert Review of Shlavim Classics 2-in-1: Goodbye to Miri's mess and Half a Cup of Water by Ruth Beifus, one of our picks of the top Jewish books for kids! Miri's mess seems insurmountable until a very special present helps Miri muster the strength to take care of her things. Shmuli has a problem — he's grumpy and kvetchy and nothing seems right. But his older brother gives him some sound advice about how to look at life like a half-cup of water, and it's enough to turn Shmuli's frown upside-down. These charming stories make this delightful book worth owning.